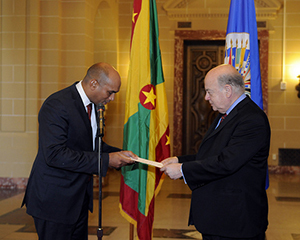 The new Permanent Representative of Grenada to the Organization of American States (OAS), Ambassador Angus Friday, today presented to the Secretary General, José Miguel Insulza, the credentials that accredit him to the institution. In this regard, he explained that one of the main priorities of his country, and one which he hopes to work on during his period in the organization, is promoting sustainable development and issues related to addressing climate and development challenges for nations, such as education and information technology. “These are for us important areas that can help to complement and support the four pillars on which the Organization is based, and for that reason we want to work with you to identify areas where we can have greater impact, as well as to identify how this institution will work in the future,” he said. Secretary General Insulza recalled the visits he has made to Grenada during his tenure and praised the work and effort made in rebuilding the country after the hurricanes that affected it almost a decade ago. “You are working very hard, and you should know that you can always count on the support of the OAS,” he said.